Brian Crawford, director of international programs at CRC, and Toni Ruchimat of Indonesia’s Ministry of Marine Affairs and Fisheries, lead a brief ceremony at the Mosby Center on Bay Campus to begin the three-week fisheries course. A delegation of Indonesian officials studied sustainable fisheries management at URI in September and returned home with much more than the luggage they arrived with. They took home knowledge, skills and commitment to craft their nation’s first fisheries management plan. Sixteen government and university representatives participated in the three-week program “Leadership for Fisheries Management” offered by the Coastal Resources Center of the Graduate School of Oceanography and the Fisheries Center of the College of Environment and Life Sciences. 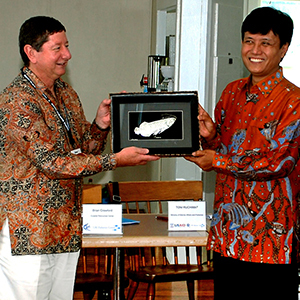 The group, with funding from the United States Agency for International Development (USAID), sought out a custom program at URI because of the university’s record of innovation in fisheries, its long history of collaboration with Indonesia and its experience providing a rich, hands-on learning experience. Indonesia’s fisheries leaders knew they needed more than a traditional training class to prepare to develop a national plan for ecologically sustainable, economically strong and resilient fisheries. “You are not just sitting in the classroom listening to lectures,” said Tonny Wagey, who works in Marine and Fisheries Research and Development at the Indonesian Ministry of Marine Affairs and Fisheries. “What I have learned is to open my mind to sharing experiences with colleagues and learning from the ‘doers,’ the local fishermen.” The participants split their time between the Bay Campus and East Farm’s Fisheries Center, and spent time in Point Judith, Jamestown and Hyannis, Mass., listening to and speaking with fishermen, fish processors, local and regional government officials and others. They toured a processing facility one day and went trawling to study selectivity on Narragansett Bay another day. Yet, the program wasn’t about simply talking to the locals. These fisheries experts were here to learn how to come together as leaders and present a plan to their nation in an effective and convincing way. CRC’s Brian Crawford, one of the course instructors and a fisheries expert, said he could see the participants become more cohesive as the days passed. “They really bonded as a group and developed a degree of trust. That goes a long way since they have been designated as an intra-agency task force to design Indonesia’s first-ever adaptive co-management process for one of the most important fisheries management areas in Indonesia, the Arafura Sea,” Crawford said. Celly Catharina of the United States Agency for Development Environment Office in Jakarta agreed. “It’s important to bring all the different partners together to learn to work toward the same goals,” said Catharina, who attended the program. The critiques focused on content, process and presentation, with URI staff offering advice learned from years in the field. Crawford, for example, stressed a concept that is a bit new to the Indonesians. “Don’t shortchange stakeholder involvement, that’s very, very important” when developing a plan that the fishing industry and officials will embrace. Catharina agreed that the group would have to persevere to promote a decentralized approach to fisheries management that involves fishermen, the public and other “unofficial” stakeholders. “I’m quite impressed the fisherman here can speak for themselves and weigh in on issues,” she said. Participants will continue to gain from URI’s singular approach to fisheries management after returning to Indonesia: CRC and URI Fisheries Center staff will stay in touch with them to gauge their progress and offer advice.